These Arsenal fans are furious at the comical defending by Shkodran Mustafi for Manchester City’s second goal. Sergio Aguero has netted twice against the Gunners today, with both strikes coming from some shocking defending by the visitors. 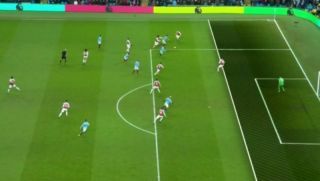 Just look at the image doing the rounds of Mustafi playing everyone and their mother onside with this awful positioning.